Why would the Jets wear white this late in the season for a home game? Can we just not? Please? It's been nearly two years (since Dec. 1, 2016, to be exact) since the Vikings wore anything but the uniform they are supposed to wear at home. Yeah the color rush vikings uniforms are bad. I wish we would of got ucla striped throwbacks instead. Probably not--since they have worn their Color Rush set twice, and I've heard they're going to wear them a third time. Actually no team has wore an alternate, color rush, or throwback more than 3 times thru this week. Thru week 11, i count the Jags teal alt, Saints CR, Rams throwbacks being worn 3 times so far. We have a good about of ones worn twice thru week 11 (Falcons throwback, Ravens alt, Bears alt, Bengals alt, Lions CR, Pats CR, Rams CR, and Titans alt). it might seem like that rules were broke, but nothing so far. 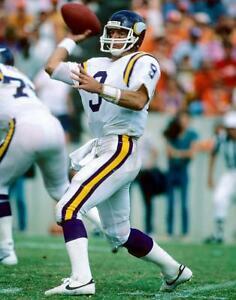 Well the Saints are rumored to be wearing throwback, so that would be their 4th time with some sort of alternate. I was only counting individual uniforms, not lumping CR, Alts, and throwbacks into one pool. if this was the case the rams would be over 3. Let's not forget that the Rams did receive special exemption from the NFL to wear the blue/yellow throwbacks 5 times, plus the mono-yellow C-R twice. Yeah, honestly, I don't need a color rush of any type at all, but if they were going to do it..
Wasn't this the Vikings home game against the Lions in 1964 when they wore white over purple in the first qtr for some unknown reason and then went mono-purple in the second qtr, and the Lions were never consulted about it? Yes, but no. For some reason, on the 1964 game, the Vikings wore White jerseys at home. The Lions never got the memo that that was happening, so it was White vs White. Refs and fans were having trouble seeing who was who and who to penalize and such. 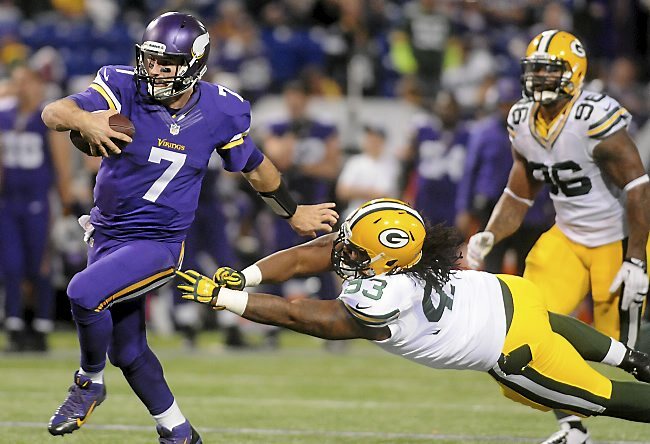 So the Vikings changed into their Purple Jerseys, but didn't change the pants, so it was Mono-Purple. After the game (Maybe? ), Coach Norm Van Brocklin didn't want to see that combo anymore, and they never wore Purple Pants at all again until the 2006 Reebok Monstrosities. They've only wore Purple Pants sparkly since then. Once in '07, once in '10, once with the current unis in 2013, and Color Rush. Yeah, the story was it was the first year the NFL allowed white at home as an option, and the Vikings decided to give the home crowd a look at their road uniform, which at the time included purple pants. The Lions either weren't informed, or forgot or something, and showed up in white also. 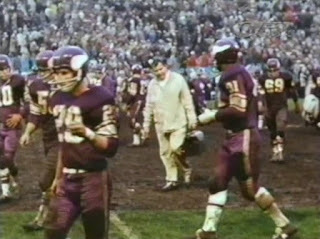 They played the first quarter white on white, until someone could head crosstown to grab the purple home jerseys, causing the Vikings to go monochrome for the rest of the game. As a side note, the Vikes' coach, Norm Van brocklyn hated how the team looked so much (he called them a bunch of Easter eggs) that he mothballed the purple pants permanently. Are all these color Rush unis confirmed for week 12 or just a guess? So far, just the Broncos and the Colts (Who are not listed as CR on the last page). The Bills have confirmed Throwbacks, and I am guessing the Lions are going throwback because because they did last year along with most other years, including 2001-2004, 2008, 2010, and last year. So most likely, all of these throwbacks and Color Rushes are going to happen. Gosh I remember that 2007 game. It was ugly in every conceivable way. Also, GridironDatabase has the Chargers wearing Color Rush. Sick is a perfect description. I feel nauseous. And the Ravens? Was that just a guess?